We Universal Infratructures systems hold expertise in manufacturing and supplying a superior quality range of MetalCeiling . The products made available by us are protected from corrosion as they are roll-formed out of hot-dip galvanized steel. Our skilled and qualified experts follow industry standards and norms in the manufacturing process. These reasonably priced products are highly appreciated by the customers owing to their easy installation and dimensional accuracy. 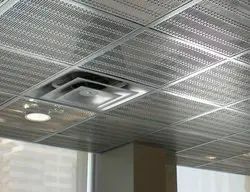 Looking for Metal Ceiling ?